We are living in a Digital Age. For organizations to remain competitive, they must develop and execute robust Digital http://flevy.com/blog/wp-content/uploads/2018/11/Primer-pic1.jpg 610w" sizes="(max-width: 300px) 100vw, 300px">Transformation Strategies. Organizations that have excelled in Digital Transformation distinguish themselves through their mastery of the 4 critical Business Ecosystems. When organizations excel at managing and integrating the 4 critical Business Ecosystems, they get to outpace their competitors. Value is create through Integrated Customer Solutions Ecosystems. A cutting-edge Customer Solutions Ecosystem is established that serve clients with complete digital product and service solution. A fit for purpose Operations Ecosystem with the right set of technologies, people, and culture is created. The Integrated Business Ecosystem Primer is the first in a series on the concept of 4 integrated Business Ecosystems that drive Digital Transformation. This provides an introduction to the 4 Business Ecosystems. A Customer Solutions Ecosystem is the Service Value Layer Business Model. A cutting-edge Customer Solutions Ecosystem serves clients with complete digital products and service solutions. The Operations Ecosystem is the solution enablement and value chain efficiency layer. It encompasses the physical activities and flows that support the Customer Solutions Ecosystem. External partners in operations such as contract manufacturers, logistic partners, and academic are part of the ecosystem. The Technology Ecosystem is the enabling ecosystem. It drives and supports improvements and breakthroughs in the Customer Solutions, Operations, and People Ecosystems. The Technology Ecosystem encompasses pivotal technologies such as Artificial Intelligence (AI), 3D printing, the Industrial Internet of Things (IIoT) and sensors, augmented and virtual reality, and robots. 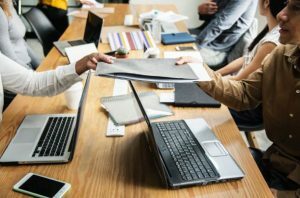 The People Ecosystem, as an enabling layer, is the domain of organizational competence and culture. The People Ecosystem is essential as people are the center of digital transformation. Looking at the Business Ecosystems Layer, it is the entirety of the 4 essential Ecosystems that are integral in digital transformation. Having a full and integrated understanding of the 4 essential Business Ecosystems will enable companies to improve value chain results and operational outcomes. The entire Integrated Business Ecosystem Primer provides companies with the essential elements of each ecosystem necessary in achieving a successful and complete digital transformation. 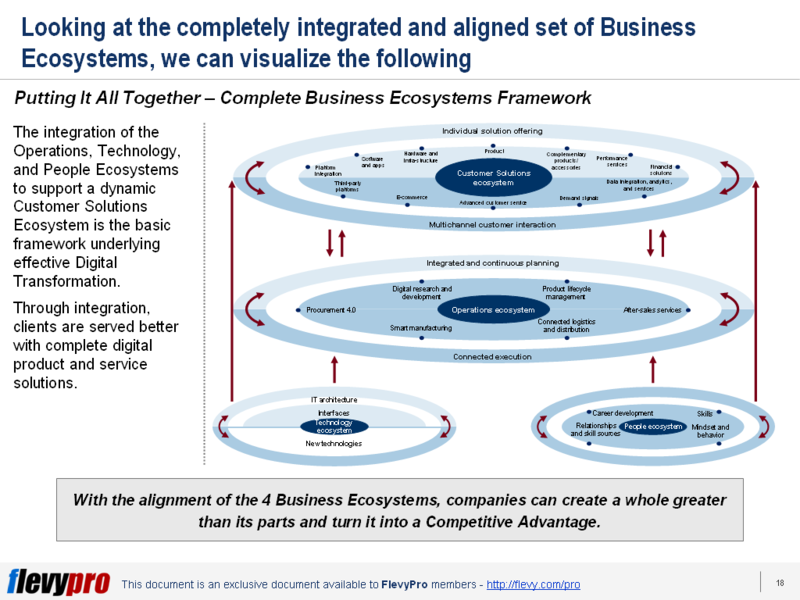 Interested in gaining more understanding on the 4 Integrated Business Ecosystems? You can learn more and download an editable PowerPoint about the Integrated Business Ecosystem of Digital Transformation here on the Flevy documents marketplace.